Selling Your European Stocks Before Everyone Sees This Chart? Flogging savers until their morale improves, that’s how ECB President Mario Draghi is going to fire up the economy in his bailiwick. Among other things, he announced that the ECB would lower key interest rates from nearly nothing to next to nothing and impose negative deposit rates on the reserves that banks stash at the ECB. The goals beyond destroying savers? Hammering down the euro, but given the efforts by the Fed, the Bank of Japan, and others to hammer down their own currencies, it’s going to be a slog. And motivating over-indebted companies to borrow even more to invest in worthy projects that don’t exist – because if they existed, banks would have already gone after them, awash in liquidity as they are. Savers are going to pay. Prudent behavior is precisely what current monetary policies are trying to stamp out. But savings used to be one of the drivers of real economic growth. Banks would lend that money to be used building a factory or a house, financing inventories, etc., creating economic activity along the way. Banks would attract that money by paying savers some interest. They’d then lend it out at a higher rate. The spread would be compensation for their role as intermediary and for shouldering the risk of the loans. Now that banks can get their money from central banks for free, savers have become the universal punching bag of monetary policy. But how good are these policies for the real economy? Japan has inflicted them on its savers for two decades, and look what happened: the government has borrowed without constraints since debt is nearly free. Result: the Japanese economy is now suffocating under a mountain of government debt. The ECB has been prescribing the same medicine for the Eurozone, but on Thursday it tweaked the dosage. And how has the economy done? Serial recessions, unemployment fiascos, toppling banks, collapsing auto sales… they didn’t exist, according to the Stoxx 600. In short, the European economy has been on a phenomenal roll. And Wall Street has been trumpeting asset allocations that are stuffed with European equities, and that has pumped American money into European stocks, and so they’ve soared even more. The Wall-Street hype machine has been in overdrive. Its “analysts” have been cranking out crazy earnings-growth estimates for the Stoxx 600 companies in order to rationalize ever higher stock prices. So for the first quarter this year, according to Thomson Reuters, analysts had forecast earnings growth of a dizzying 36.3%. 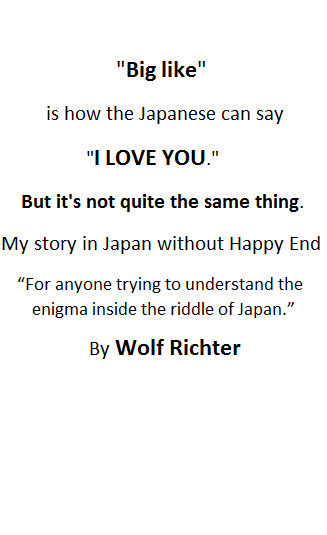 That was on July 1, 2013. By October 1, they’d lowered their forecasts to 29.2%, and by February to 10.4%. By May 29, as companies were reporting the actual numbers, the growth “forecast” had unceremoniously dropped to 1.9%. Same thing quarter after quarter. For the fourth quarter 2014, they’re still riding their favorite hype horse, currently expecting, I’m not kidding, 39.3% earnings growth, which is down from 40.2% a week earlier! And it has been doing wonders to the Stoxx 600 which continues to defy gravity. But what the heck is wrong with this picture? Since July 2011, earnings have been falling! And that, despite quarter after quarter of Wall-Street forecasts of dizzying earnings growth for future quarters that then get whittled down to nothing! 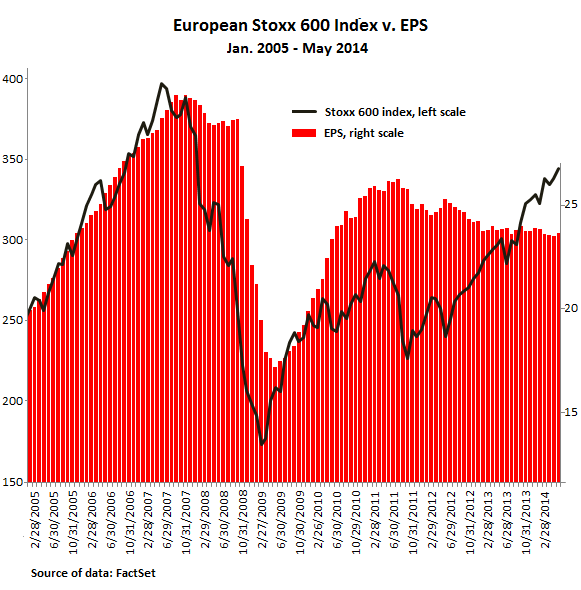 As of May 30, according to data provided by FactSet, the Stoxx 600 had EPS of 23.67. That’s down 0.7% from a year ago, and down 11.2% from July 2011. These miraculous European companies that make up this gravity-defying index and that have been trumpeted by Wall Street with such conviction are making less now than they did three years ago during the depth of the Eurozone debt crisis! This has been Draghi’s great success, aided and abetted by Wall Street: pumping up European stocks (and bonds, including Greek government bonds, and all manner of other crappy assets) while corporate earnings have been declining – for nearly three years! But something has to give. It’s doubtful that these companies will suddenly, and without any reason whatsoever, see their earnings soar, as “analysts” predict, by 39% or whatever. Leaves the stock valuations…. US investors who plow their dollars into equities that trade in euros are not only facing equity market risk but also currency risk. And if Draghi has his way, and if the French government and most Eurozone governments have their way, the euro will fall sharply against the dollar. And then any losses from declining stocks, as American investors are yanking out their money while they still can, will be compounded by having to convert those proceeds into dollars. This is going to be one heck of a party.